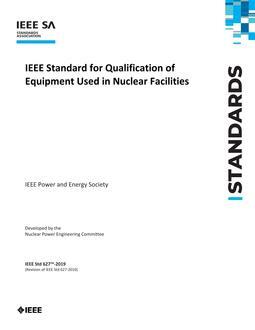 This standard provides the basic principles for qualification of equipment used in nuclear facilities. The purpose of this standard is to provide basic principles and guidance to demonstrate the qualification of equipment. Qualification is intended to confirm the adequacy of the equipment design to perform its required function or functions over the expected range of normal, abnormal, design basis event, post design basis event, severe accident, and in-service test conditions. Revision Standard - Active - Draft. Guidance on basic qualification principles 1 and appropriate methods of demonstrating the qualification of equipment used in nuclear facilities is provided in this standard. The principles, methods, and procedures described are intended to be used for qualifying equipment.